Winter Hair Problems? No Problem! Do you want to make your dry, brittle hair soft and smooth and get rid of those embarrassing flakes? Every year winter rolls around and it brings with it nasty weather and dry air. Do you feel like you're a victim of dry winter hair, a flaky scalp and are desperately seeking for a solution? With Shear Miracle Organics, you'll have no problem! Let me introduce you to what Shear Miracle Organics deep conditioning treatments can do for your hair. If you have an Organic Salon who uses Shear Miracle Organics near you, you can get this treatment done for you. If you are unable to make it to an organic salon carrying Shear Miracle Organics products, here is an easy do-it-yourself routine that you can do at home with products you can purchase right here on this site. This luxurious treatment is recommended every 2-3 weeks during the winter and even throughout the year if you happen to routinely use heated tools on your hair. It's not hard to have Perfect Hair. You simply use Perfect Ingredients. 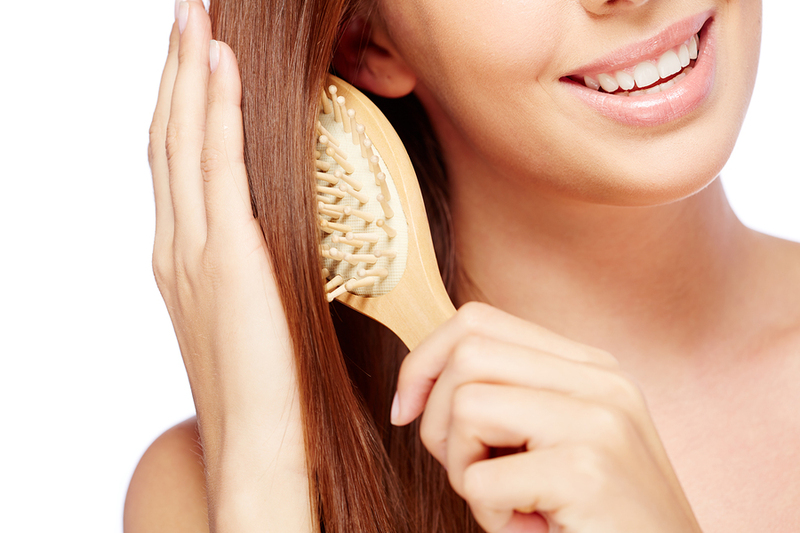 Brush your hair with a bamboo bristled brush, paying careful attention to the scalp area. To remove any residue from traditional styling products or previous shampoos and conditioners (if you are not currently using all organic products), start by using a clarifying shampoo like our Fresh Canvas Detox Shampoo. Skip this step if this does not apply to you. Wash your hair with a moisturizing shampoo like our super softening Lavender Bliss Shampoo. Combine 2 tablespoons of Tuff'N Up Conditioner with 2 tablespoons of Lavender Bliss Conditioner and apply to hair from roots to ends and cover with a plastic cap. Sit under a dryer for 30minutes. If you do not have a dryer, you can most likely purchase a portable, adjustable one at your local beauty supply center for under $75. Rinse thoroughly with lukewarm water. *Do not use hot water. Apply Achieve Finishing Lotion cocktailed with Soft as Satin Hair Polish from the mid length of your hair to your ends. You can let your hair air dry or use a diffuser. If you have fine hair, Wild in the Child Conditioner may be used in place of Lavender Bliss. For additional care, add a couple drops of Rosemary Essential Oil to any Shear Miracle Organics shampoos as often as you need to cleanse. This will improve the health of your scalp as well as increase the speed of growth of your hair. Want a FREE sample with your order? Add a request in the comments section upon ordering. Learn more about how Certified Pure Therapeutic Grade essential oils are being used in our Organic Salon and how they have changed Organic Stylists, Robyn & Julie's life for the better. Click here to learn more! I have done these simple steps and my hair has never been this great throughout these long winter months. Just look at my hair! I am excited to end your winter hair problems!